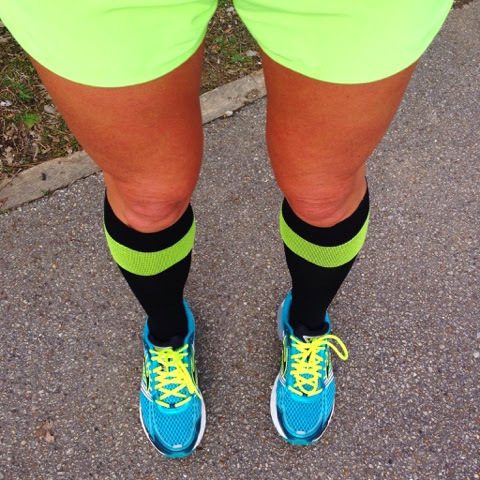 Welcome to my ZENSAH #WhiteToBright Project! 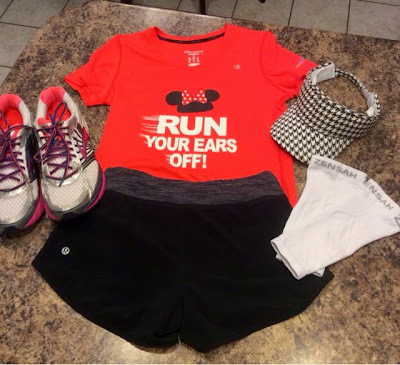 I was asked to throw together a quick little outfit using ZENSAH "White" calf sleeves by my friend @redheadbabymama!.....I thought about this for a bit and realized that "white" pieces of running gear are just something that I don't purchase too much of. I have two solid skirts and ZERO white shirts (unless they are race event shirts and then they are covered with logos.). Wonder why I don't buy any white?? Borrrrrrring. 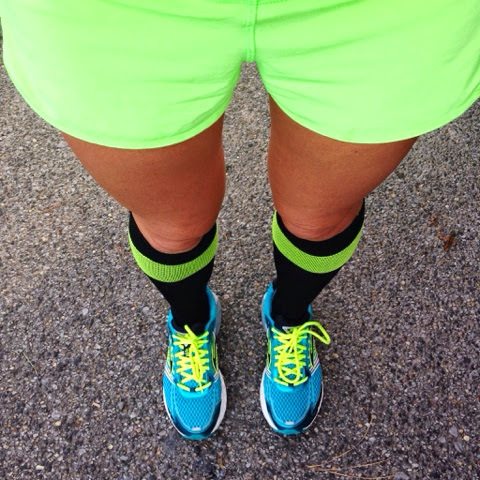 I like BRIGHT outfits!!! This might be just a little bit of a challenge for me! What I came up with was something cute and SIMPLE. I chose to pair my calf sleeves with solid Black shorts, a super cute red top, a houndstooth visor (because I'm from Alambama, ya'll) and my white running shoes. 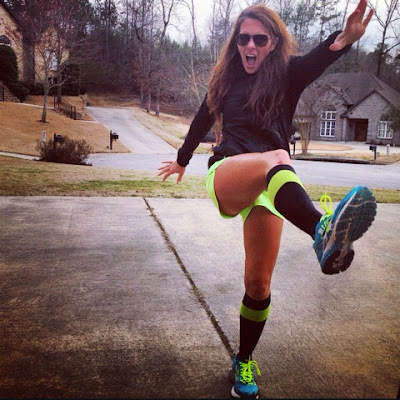 Most runners own a pair of black shorts....mine are LuLulemon. My visor is from my local Alabama College Football Spirit store. 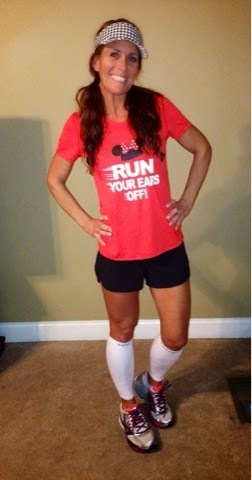 My shirt is a Champion/runDisney shirt that I purchased from the Health and Fitness Expo at Walt Disney World. My shoes are Brooks Adrenaline GTS15. Why did I choose these items?? I chose them because I like to color coordinate. The houndstooth visor gave me a little bit of playful pattern, the red shirt was BRIGHT and the I absolutely loved the White Block Font to match up with the calf sleeves. The Black Shorts?? Well. One can never go wrong with Black and most runners own a pair of solid black shorts. So there you have it. 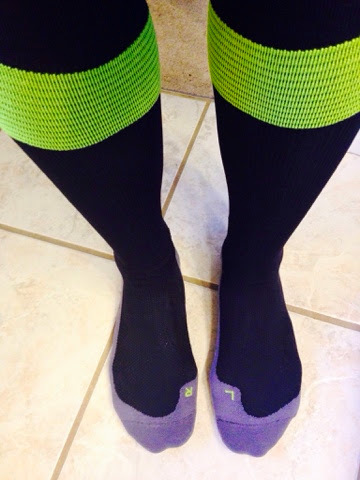 I would have probably never picked out White Calf Sleeves when given so many different options to purchase from ZENSAH. However, now that I have taken on the #WhiteToBright Challenge, I will totally be re-thinking my current wardrobe and how I can turn those whites into BRIGHTS!!! How Do I like them?? ZENSAH has given me a pair of White Calf Sleeves to give to you!! Leave a comment here and let me know that you want to win them!! It's THAT easy!! I will pick a random winner by the end of next weekend, so hurry! 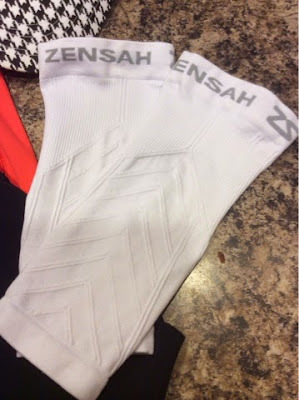 For more information on these Calf Sleeves and other great compression products from ZENSAH, please visit ZENSAH.com and be sure to follow the Hashtag #WhiteToBright to see other ways to use your white sleeves!! Disclaimer: I was provided a pair of white calf sleeves to coordinate and outfit with and also one pair to give to you!! Thank you ZENSAH!! What you might see me post online may seem like my life is simply beautiful and full of nothing but goodness. And most days it is.....but when you have someone (who doesn't know you at all) say that "all you do is leave". HERE WE GO. Get to know me a little....you're a little bit on my nerves. There's a lot that goes on behind my scenes. 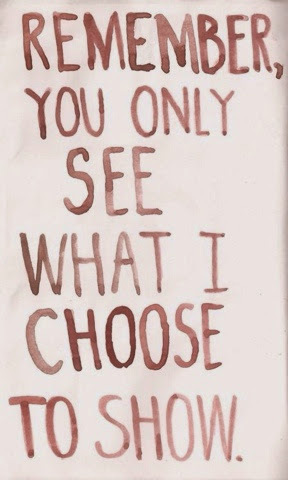 You are right. I do make time for ME and I don't apologize for that. It's almost 3:30pm, I worked out hard today. One hour of CrossFit and 3.1 on the treadmill after I got my kiddos off to school and I'm JUST NOW making a quick sandwich with the end pieces because I forgot that we are out of bread. Terrible. Just terrible. Please don't follow my example on this one.... Most days I try to eat and recover after a good workout but today was not the case. I was headed home after my workout....got a text from my Mom. Had to run by and see her at work, I was supposed to stop by a printing company for a 5k that I'm working on. That didn't happen. The guy was gone to lunch. I missed him. I'll go tomorrow. I volunteered to bring dinner for a lady at church who is fighting cancer....I gotta get to the store. Meanwhile my hubs calls..."Hey Gramma wants you to take her to get her nails and hair done." One of my kids left their track clothes at home. Go to the school. Detour again. Pick up my Gramma, go grocery shopping for the church dinner. Keep in mind that I'm not cooking dinner for my own family....we will grab leftovers at home. Take her to hair appointment. I run over to the tanning bed. That's right. I laid there IN SILENCE for 15 minutes. Go back and pick her up. Get home and start cooking the church dinner...it needs to be delivered by 5pm. Inhale a sandwich, I'm jumping in the shower, gotta go run and pick up my girls by 5 too. Conflict of time! I have to hurry. My Gramma's Physical Therapist will be stopping by 4:00. My boy has a Basketball tournament tonight. We need to eat dinner and have homework done by 6:00. At the latest, 6:15. Hey, this is kinda my day everyday....BUSY. Family of 6. 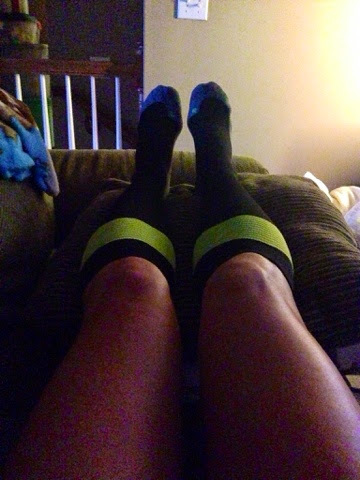 So when my hubs calls and says, "How could you forget to this? How could you forget to do that?" He's a crazy person so I tune him completely out. I mean like, I REALLY TUNE THAT NONSENSE OUT. Goooooood grief!!! I'm doing good to keep my head on straight and chug down as much coffee as I can. But guess who is not complaining?!?? Ummmm. That would be me. I'm glad that I was home to get my kids off to school. I'm glad that I got to see my Mom. I was texting my sis while I waited for my Gramma. That nice lady at Church will have a home cooked meal....her life is terribly different than mine right now. I chatted with my Bestie on the phone on my way home from my workout. I listened to my girls go nuts about how sore they are after track practice. I have a good tan going on. I get to see my boy tear it up tonight on the Basketball court. My Gramma looks fabulous. And yeah, I'm still a little hungry but I'll throw a protein bar in my purse and will be just fine. I'm typing this while I'm drinking a cup of coffee and most likely will Instagram something ridiculous. 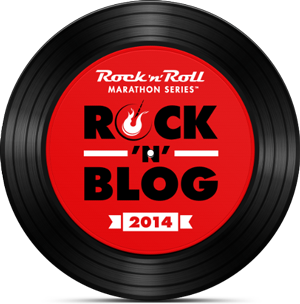 Road Runner Sports Runner Of The Month---Hey! That's Me! 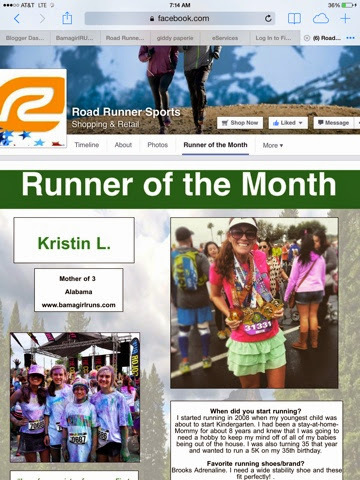 But seriously, I really was taken by total surprise a few weeks ago when I received an email from Road Runner Sports asking me if I minded being featured as their February Runner of the Month. Would I mind?!?!? Are you kidding me??? 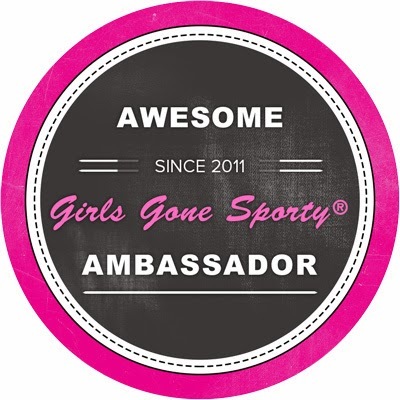 I was SOOOOOOO flattered that they (one of the largest sports stores) wanted ME. WOAH. I have no words!!! I have been ordering my running shoes from them for years. They are lightning fast with their shipping and have an awesome VIP program. To me, I'm just a girl who jumps on the treadmill most days, takes a few workout classes, cooks dinner every night and runs my kids around to ball games, practices etc. 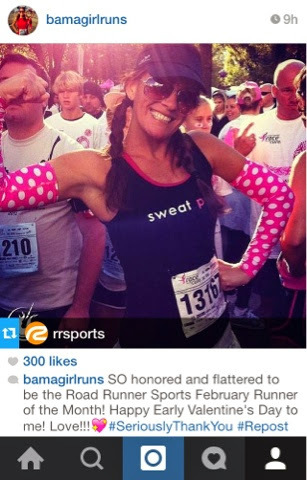 However, I do run a lot of races, I train hard and I'm a social media butterfly so I GET it. I want to inspire people. I want to encourage others to just get out there and do it. Whatever "iT" is for you. 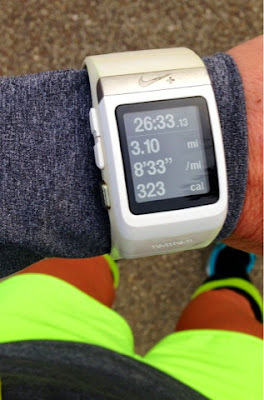 Running is totally my thing and I love it whether I run outside by myself, on the treadmill, or at an organized race. I love it all and can't get enough. To say the words "Thank You", may not seem like enough but seriously, THANK YOU. 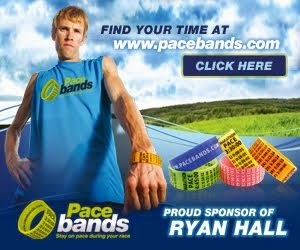 I'm beyond excited to work with Road Runner Sports. I'm feeling like a true VIP!!! I even ordered a new Road Runner Hoodie and can't wait to sport that around after my workouts!